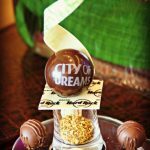 While I could have spent days luxuriating in the comforts of the Mandarin Oriental, Macau, I did not fly all the way across the world to not explore my exotic surroundings. 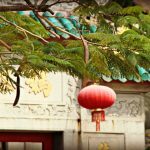 Macau is considered the gateway into how Western civilization first entered China. 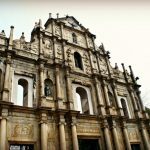 The best place in the region to see this extraordinary symbiosis of cultures is in the historical center, which was classified a UNESCO World Heritage site in 2005, and that is exactly where I spent the entire day with Macau Tourism. Macau Museum is an excellent place to begin a tour, as it displays and explains the history and traditions of Macau through permanent collections and exhibitions. It is also a lovely place to take a city break if needed. My favorite part of the museum were the spectacular cityscape views of Macau, where it is possible to see that while the region has moved into present day with its modern hotel and buildings, it has still retained its unique heritage that dates back thousands of years. Besides the fact that the historical center is infectiously fascinating, everything is within walking distance. There are a total of 20 sites, with the most famous being next on our list and right around the corner from the museum. . . Thank you sweetheart, it really was so pretty!!! Hong Kong via Maccau was a trip that planned and then subsequently canceled. Judging by these photos, I need to revisit the idea of going and soon. Oh noooo, how sad! You must plan the trip again. You’d LOVE it!!! Wow Andi, these pictures are beautiful!! I heard some great things about Macau. I really hope to visit it within the next two months! Thank you sooo much Lisa! I really want to visit Macau now! Yay! I hope you can visit soon. Gorgeous photos as always! What’s that tree in the 5th pic? Looks monumental! Thank you so much dear! I wish I knew the name of it, it was SO gorgeous!!! I really don’t know much about Macau except for the bird, so I am looking for to this series. It’s the second time when i’ve seen your site. It’s really wonderful! So happy to hear that, thanks! Wow! What else can I say to this post, really? I especially love the picture of the city view. Awww thank you so much!!! Glad you enjoyed the post! I LOVE that cultural museum. It was one of my favories things in Macau. Great shot of the large tree with hanging moss! I’m putting Macau on the Bucket List! Thank you darling! Truly magical you’re right!!! Looks fascinating! My trip to HK this summer was cancelled due to our big move but I sure hope to make it there, and Macau sometime in the future! I’m so sorry your trip was cancelled, fingers crossed you can make it there soon! You’ll LOVE both HK and Macau!!! So interesting (and gorgeous) to know more about Macau thru you. You did an awesome job on this post! Beautiful photos! I’ll definitely be keeping this in mind when I get to Macau next year. Thanks dear! You’re going to love it!!! I love you so much and I’m so lucky to be able to spend the rest of my life with such a beautiful, amazing, talented woman! Sweetheart, I love you so much too, thank you for all of your compliments — I have tears in my eyes!!! You make the world so inspiring! What a compliment, I’m humbled! 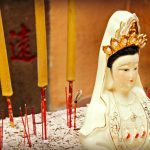 I’m so glad you liked the cultural parts of Macau–those were my favorite too. I mean, the idea of Portuguese history is just palpable everywhere, but few actually SEE it because they spend so much time at the casinos. And yes, Mandarin was my favorite hotel too! Great pictures. Thank you!!! Agree, most people just see the inside of the casinos (which by the way are pretty awesome), but they miss out on SO much. The history is just amazing! Thank you, I love that shot too! I hear so much about Macau being flashy that I didn’t know there was still a lot of history left. I’m glad to hear it! It’s so sad that the only aspect of Macau that is really talked about are the casinos, I suppose it’s the same for Vegas too? But, there is SO much more!!! How beautiful are those trees??? I want to go to Macau! Thank you so much for the great post. Just love it! Gorgeous. <3 I especially love the fifth photo. I can’t believe you get to do this for a living (or at least a part of it). Gorgeous pics, Andi — I especially love the greenery. Macau looks amazing! It really is so amazing, thank you so much for your kind words!!! Thanks gorgeous!!! You would love it there. I always love going back to Macau, place is so rich in culture and the food is amazing! I definitely hope to return myself!!! What fabulous photos! Ok I’m so jealous that you were just in Brazil and now Macau! You are definitely inspiring my wanderlust! Sooo happy to hear that! thank you for sharing your knowledge. i really appreciate it! Since I love Vegas, I gotta check this place out! You must! Gambling + culture = amazing!!! I love the mossy tree. So astounding to me that Macau looks like this. Seems so different than HK. Would you say that it is? it was nice to read your blog. the thoughts are very well laid out and it was refreshing to read! Happy to hear that Adam! Love the photos, this is not a place I have thought about visiting, so I am looking forward to getting immersed into your trip! Thanks sweetie, glad you like them! I think you would LOVE Macau! It’s amazing that Macau brings in more gaming revenue than Las Vegas! Great pics! Isn’t that crazy? Thank you!! !